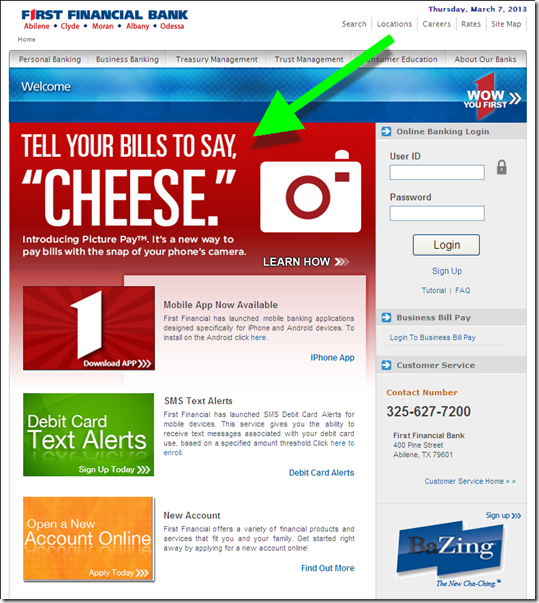 I started this post Monday, before I knew US Bank would be making headlines today as the first “major” bank with photo billpay. I got that news last night, when I updated my US Bank iPhone app (see inset). But First Financial Bank (Abilene, TX; $3.7 billion deposits) actually beat US Bank ($235 billion) to market by more than a month with its 22 Jan 2013 launch (press release; YouTube video). The bank said it had 12,000 bill uploads during the first 10-days of availability. Both services use the Mitek engine to read the image and handle the OCR work. 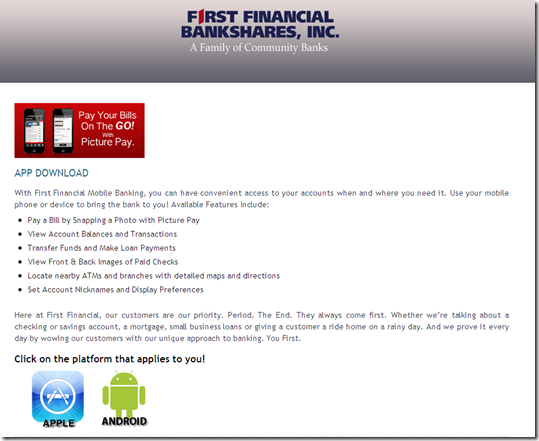 But First Financial also uses Allied Payment Network to process images that don’t get properly digitized on the first pass and Malauzai Software for app development. Like remote check deposit, the system will improve over time as it learns the nuances of the thousands of billing statements fed into the front end. But today, there is still work to be done on the minority of statements that don’t read correctly (see note 1). 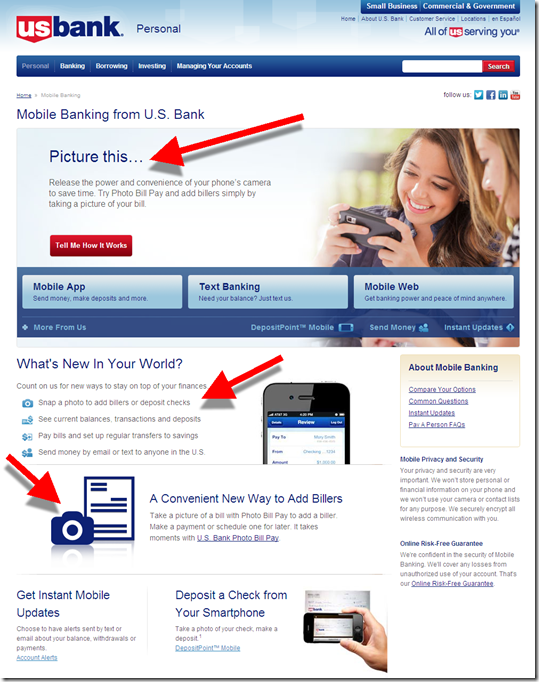 US Bank has no mention of it on the front page (nor in site search), but if you navigate to its mobile banking page, you can’t miss it (third screenshot below). 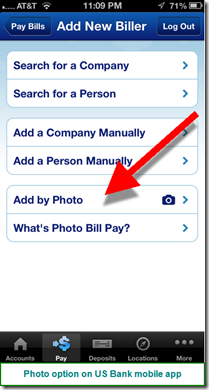 Bottom line: I’m not sure how many people will ultimately use photo billpay (though First Financial seems to be off to a good start). It’s an interim technology until we can convert the country to ebills. But since that may be a decade from now, using your smartphone to snap-and-pay is the best answer for now. So, we are bestowing our first OBR Best of the Web of 2013 to First Financial for raising the bar in remote delivery (notes 2, 3). And an honorable mention to US Bank for getting it out to a broader market. 1. Just today, the Chase ATM couldn’t read the amount on a computer-generated check we fed into its deposit slot. So we had to manually add. 2. This Best of the Web goes to First Financial since it was first. Mitek already won when it introduced the technology in 2010 (see our Online Banking Report on Paperless Banking (subscription). 3. Since 1997, our Online Banking Report has periodically given OBR Best of the Web awards to companies that pioneer new online- or mobile-banking features. It is not an endorsement of the company or product, just recognition for what we believe is an important industry development. In total, 89 companies have won the award. This is the first for First Financial. Recent winners are profiled in the Netbanker archives.